Cap: Caps should be worn flat, with corner centered at forehead. Description: Caps are made from lightweight, durable fabric. Available in Black, Dark Navy, White, and Royal. Tassel: Tassel should be hanging on right side of cap before the ceremony, and moved to the left after diploma is received. Description: Tassel comes with a metallic dated gold charm. *We've done our best to capture the true color of caps in these photos. Colors may appear slightly lighter or darker - depending on your device's screen settings. Please note that caps have a matte finish and are not shiny. From Brian Stevens of Rockton, Illinois on 3/25/2019 . From Anonymous of Sheboygan, Wisconsin on 2/11/2019 . From Rachel Fowler of Saint Charles, Illinois on 4/5/2017 . From Christine B. of Belton, Texas on 6/27/2016 . From Anonymous of Rosdale. , Maryland on 2/14/2016 . From Anonymous of Fredericksburg, Virginia on 4/18/2015 . From Sandra George of Lake Village, Indiana on 6/4/2014 . 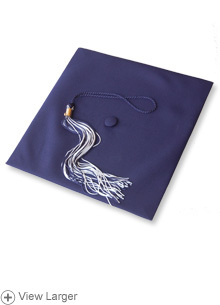 4/25/2015 – I had to measure the diameter of my son's head when ordering a cap for his high school graduation five years ago. How does . . .